The 2017 Peaceful Pill Handbook (print edition) provides readers with 23 Chapters of information on end of life choices that are peaceful and reliable. The Handbook provides practical information delivered in lay language to empower all folk of sound mind who want control over their end of life choices. 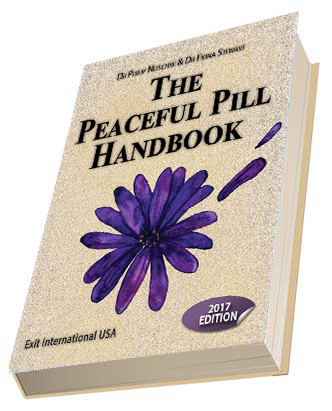 The 2017 print book is based on the February 2017 edition of The online Peaceful Pill eHandbook. This book is only available to readers who are 50 years and over, of sound mind (or have an alternative good reason for wanting this information – so please ask us). Anyone with a serious illness is welcome to purchase this book regardless of age. Please allow up to 28 days for shipping. The book you order at the time of ordering is what you get.